Dogs’ paws are made for walking and they’re accustomed to navigating tough surfaces. However, this does not make them immune to sore paws or injury. Sharp objects on the ground or weather conditions can impact the condition of your dog’s paws. 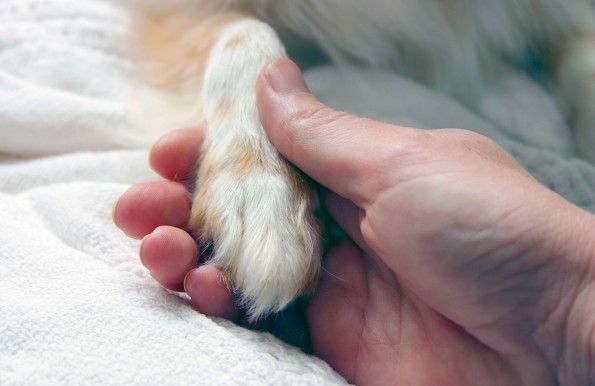 Additionally, without regular maintenance, your dog’s paws may become sore and painful. Fortunately, it only takes a bit of TLC to preserve your dog’s paws and keep them healthy and injury-free. The hair around your dog’s paws and between their toes may become matted and even painful if it isn’t maintained regularly. Regularly comb out and trim that hair to avoid tangles and keep your dog’s paws pain-free. Like your hands, your dog’s paws can benefit from a good moisturizing to prevent them from becoming too dry or even cracking. However, unlike your hands, your dog’s paws can get too soft if the wrong moisturizer is used. So avoid your scented hand moisturizer and talk to us instead about a moisturizer specifically for your dog’s paws. Sharp or small objects may become embedded either in your dog’s paws or between their toes. When cleaning and trimming your dog’s paws, take a moment to inspect and remove any foreign objects that may have become lodged in them. If you can’t reach with your fingers, use a pair of tweezers to gently remove any splinters. Avoid hot pavement, concrete, and sand, and stick to the grass whenever possible. If you can’t avoid pavement, test it before heading out. As a rule of thumb, if it’s uncomfortable for you to walk on in bare feet, it’s also too hot for your dog. Additionally, try to keep walks to the cooler parts of the day, around sun up and sun down. And if you do notice that your dog’s paws are burned or blistered, bring them in to see us immediately. When it’s very cold outside, your dog is at risk of frostbite or hypothermia. Avoid leaving your dog out for long periods of time in very cold temperatures. When it comes to walks, you can protect your dog from the elements by dressing them in booties. If your dog really resists wearing booties, make sure that you’re wiping their paws after they go outdoors to remove any salt or chemicals that could be harmful. When is your dog’s behavior indicative of potential problems with their paws? Limping could be one indication that your dog has painful paws. Excessively licking of the paws can also suggest an issue, such as an allergy that causes your dog’s paws to be itchy. If your dog is continuously limping or excessively licking their paws, bring them into us for a visit. When it comes to the health of your dog’s paws, it’s always better to be safe than sorry!